Sliding doors have been around for a long time, but they have one disadvantage; only one door can be opened at a time. This at times posed a problem for me as a building inspector because I had to get a stepladder inside the closet in order to to get access to the attic hatch. Sliding doors are ideal for areas where a normal swing door would take up too much space. Doors which slide along overhead tracks don't take up any floor space. In most cases, sliding doors have two movable sections and sometimes as many as three. The doors can move freely in both directions and are suspended by rollers from parallel overhead tracks. Short plastic guides can be fastened to the floor to keep the doors from rattling and rubbing against each other. Up until now we have been talking about regular size sliding doors but there are also SLIDING PANEL DOORS (see picture to the left) which are four feet (1.22 m) wide and approximately eight feet (2.44 m) tall. They run from floor to ceiling and are constructed from 1/4" (6 mm) thick pre-finished panels set in a light weight metal frame. These doors are very flimsy and in addition to the top rollers they have rollers in the bottom corners as well which are locked into a floor track. The rollers have a tendency of loosening during normal operations and will have to be checked and re-adjusted from time to time. Door pulls are recessed into the door so that the doors can bypass each other unobstructed. Even though the doors can be opened and closed in both directions there is a left and a right hand door as determined by the location of the door pulls. When in closed position the doors will overlap slightly so there is no gap between the doors. 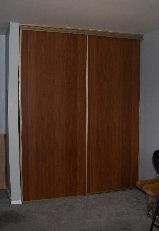 Mirrored sliding doors are commonly used for front entrance clothe closets and bedroom closets where they come in handy as full length dressing mirrors. Mirrored sliding doors can make a hallway or room look bigger and reflect light for a brighter look, see photo. Common widths are 24, 30, 32, and 36 inches. The standard height is 80", which can be trimmed if necessary. Make sure you trim from the bottom of the door, not the top!